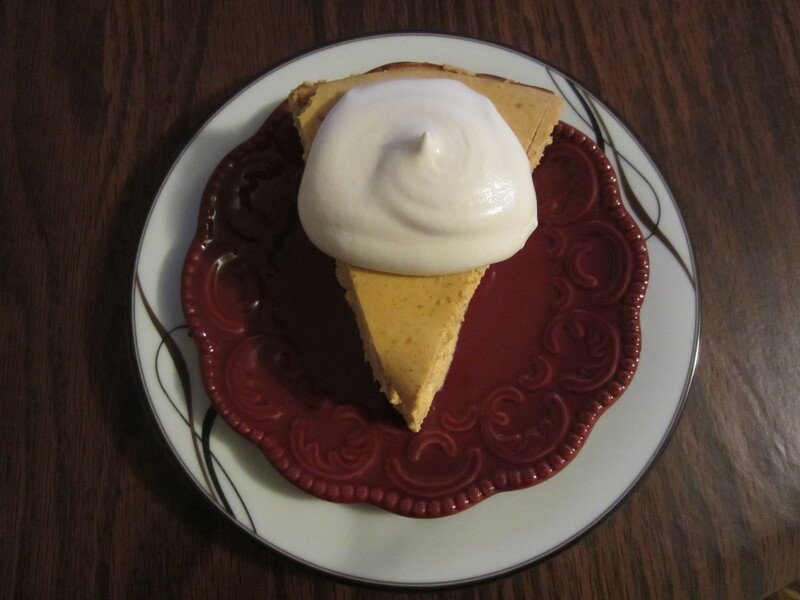 I found this scrumptious looking pumpkin cheesecake recipe on a gluten free blog, and just couldn’t help but tackle the challenge of making it lighter. So I contacted the author of the blog (GF and Me) and asked permission to try. She loved the idea, and here are the results. I’m really proud of this cheesecake. I love pumpkin anyway, but to guiltlessly eat a really big slice of pumpkin cheesecake? Yes! And, since we’re using Greek yogurt cream cheese (which I found at Walmart, by the way), the protein count is nice and high too, so your calories are coming from some seriously good nutrition. Now a couple of key cooking points: soften the cream cheese! If you don’t, you’ll end up with lumps (something GF and Me made very clear, so luckily, I didn’t make that mistake). She also suggested making this a day ahead of time so the flavors have time to really meld. And I love the towel idea. I’ve never covered anything with a towel in the fridge before, and I should have. It does away with the condensation. If you’re looking for an all-natural low calorie cheesecake, you can use whipped cream, real maple syrup, and even regular sugar. If you read through the recipe below, you’ll notice I didn’t do that. I went with “substitute” options. I chose Truvia because it’s supposed to be the most natural option on the market as far as artificial sweetners go, and the baking blend is surprisingly half the calories of Splenda. Just remember that your calorie and carbohydrate count will be much, much higher if you choose the more natural route. To find GF and Me’s original recipe, click here. Preheat oven to 350 degrees. Line a 9-inch spring form pan with parchment paper, or grease a 9-inch pie plate with nonstick cooking spray. In a mixer, blend together softened cream cheese and sugar blend. Add the egg whites two at a time and blend. Add the pumpkin and spices, and mix until combined and smooth. Pour the mixture into pan and bake for 45 minutes, or until the center is almost set. Remove from oven and let cheesecake cook on the counter. Cover with a clean tea towel and refrigerate for at least 4 hours. For the topping, put the thawed, whipped topping in a small bowl and gently fold in the maple syrup, stirring until combined. Cover and refrigerate until needed. Nutrition Disclaimer: I am not a certified nutritionist…these are just the calculations I’m pretty sure are close to correct. I use BodyMedia to generate my information. Weight Watchers: 6 Points (using calculatorcat.com). Wow! Your low calorie versions looks fantastic! Good to know that using truvia didn’t seem to affect the look or texture. And I love the maple whipped topping idea. I’m going to have to try this adaptation next time! Thanks! I’d say that if anything did affect the texture, it was the Greek yogurt cream cheese. The cheesecake wasn’t light, as in fluffy. It was more dense, but then again, I think that made it very rich, and therefore, very filling. Not surprised at all. 🙂 But make sure to add 1/2 a cup of sugar to replace the 1/4 cup of Truvia Baking Blend. Because Truvia (and Splenda works this same way) is so sweet, you actually use half as compared to non-blended, real sugar.